“We have not received formal confirmation of precisely what is to be agreed,” Ruairí Quinn told the Dáil. IRELAND AND THE European Central Bank have reportedly reached an agreement on the promissory note for IBRC. Reuters reports that the deal was struck this afternoon following the marathon session in the Dáil overnight to liquidate the former Anglo Irish Bank. However the Department of Finance refused to comment on whether an agreement had been reached. A spokesperson said there was as yet no indication as to whether Michael Noonan will be making a statement on the matter. We have not received formal confirmation of precisely what is to be agreed and when we have that information, the Government will resume. It will meet and it will decide what the appropriate response is, and as soon as it happens we will then communicate with the House. The President of the ECB Mario Draghi is due to be holding a news conference at 1.30pm at which he is expected to speak about the Irish situation. Members of the Government have been adamant since late last year that Ireland would not be paying the promissory note in its current form when the €3.1 billion payment falls due at the end of March. President Michael D Higgins signed the Irish Bank Resolution Corporation Bill 2013 into law at 7.11am after the overnight session in the Dáil and Seanad which began late on Wednesday night. The Government had been planning to liquidate the toxic IBRC for some time but the plans were expedited yesterday evening when Reuters carried a report about the planned liquidation. Michael Noonan said that there as an “immediate risk to the bank” when the plan was made public which led to the Government taking unexpected action to secure the bank’s assets. 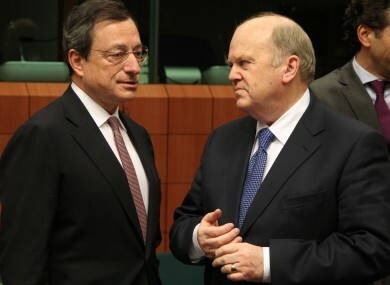 Email “Ireland and the ECB reach a deal on promissory note - report”. Feedback on “Ireland and the ECB reach a deal on promissory note - report”.